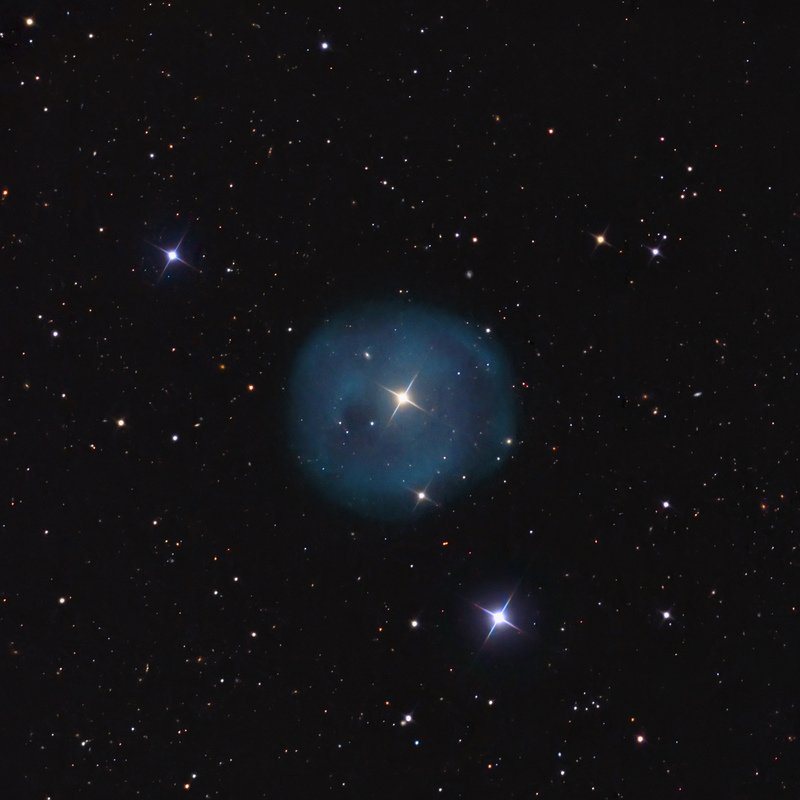 LoTr5 is a large, faint, ancient planetary nebula (PN) in Coma Berenices at RA 12h 55m 33s and DEC +25° 53′ 04". North is up and to the left. The field is 30′ x 30′ and the PN is about 10-11′ in diameter. 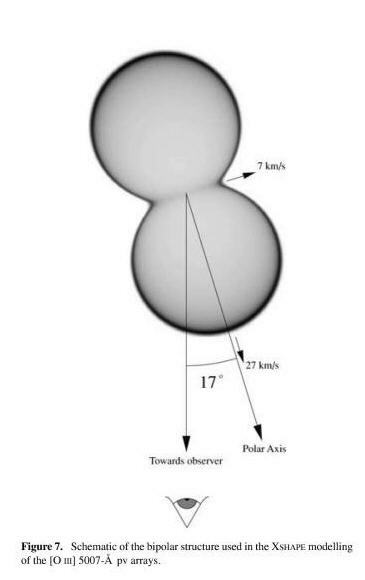 It was discovered in 1980 by Longmore and Tritton from the UK Schmidt ESP/SRC Southern Sky Survey. It was not visible in the Palomar Sky Survey. It is not perfectly circular, suggesting a binary star source where one was a hot star that ejected the nebula. LoTr5 has some internal structure, as shown in my image. Tweedy and Kwitter (ApJS, 107, 255, 1996) concluded that it shows no interaction with the interstellar medium. As is typical for PN, there is a wide range of distance estimates, from 0.5 – 2.3 kpc. 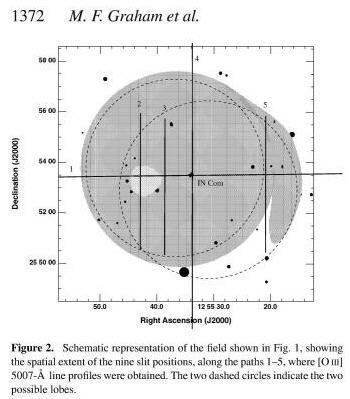 LoTr5 is the highest galactic latitude PN known, being nearly overhead. OIII is ionized by the hot (150,000K) separated binary companion of the cool (5230K G5III) star (HD 112313, SAO 82570). The bright star in the center of the PN is identfied as SAO 82570 in TheSkyX, so it apparently is the central star of this PN. As of the year 2000, this was the hottest companion star in any PN found to-date. The "spiral arm" to the right of the PN may represent the exterior of a second "lobe" of a two-lobed bipolar PN, according to Graham, et. al (Mon. Not. R. Astron. Soc. 347, 1370Ð1378, 2004), as shown below. LoTr5 strongly emits OIII, but I was able to pick up weaker H-a emission within the OIII envelope that creates the central magenta hue. OIII was colorized to a blue-green and H-a to magenta/red. They were added to the RGB data.